Consonants that are produced by stopping the air flow are fittingly called stops or stop consonants. 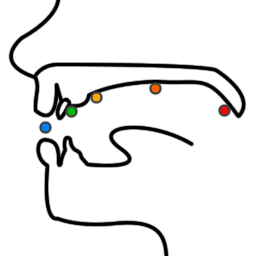 When pronouncing a stop consonant, the air flow stops within the mouth, and no air exits through the nose. Once the air is stopped, it is quickly released. This release produces a sound. An example of a stop is the letter "k." Here, the air stops at the back of the mouth before continuing. The stop is related to the nasal, which is produced by stopping the air flow and redirecting it through the nose. An example of a nasal is the letter "m." Here, the air stops at the lips and goes through the nose instead. The hard palate. The hard palate is the bony region at the top of the mouth. You can see that the list above starts at the back of the mouth and moves to the front. This is how the stops and nasals are ordered, too. Now let's learn some of the stops and nasals. Remember that we're proceeding from the back of the mouth to the front. The vowels, too, are arranged according to their point of pronunciation. a is said to be pronounced at the soft palate, i at the hard palate, and u at the lips. ṛ is not where we would expect; perhaps this is because ṛ has a slightly odd pronunciation. The same organization scheme that is used for Sanskrit eventually found its way to Japan, where it influenced the arrangement of the letters in the Japanese writing system. For more information, you can read "The Influence of Sanskrit on the Japanese Sound System". To produce these sounds, we stop the air at the soft palate. To stop the air, we use the base of the tongue. To produce these consonants, we stop the air at the hard palate. To stop the air, we use the middle of the tongue. None of these sounds appear in English. Terms like "soft palate consonants" and "hard palate consonants" are short and easy to understand, but "behind-the-bony-bump-on-the-roof-of-the-mouth consonants" is long and hard to read! These consonants are called by many names, but it's easiest to call them retroflex consonants. This term shows that the tongue bends ("-flex") backward ("retro-"). To produce the retroflex consonants, we stop the air behind the bony bump on the roof of the mouth. To stop the air, we use the tip of the tongue. Again, none of these sounds appear in English. Gray boxes, like this one, contain information about Indo-European linguistics and languages related to Sanskrit. Although I think this is a fascinating topic, I know that many do not feel the same way. Fortunately, these linguistic digressions are optional and clearly marked. Feel free to skip them! The retroflex consonants do not exist in Greek, Latin, Avestan, Old Persian, Hittite, or the other old Indo-European languages. Their absence in these languages is significant. Because of their absence, most linguists say that Sanskrit could not have been the ancestor of all other Indo-European languages, as a few linguists have proposed. Retroflex consonants, however, exist in languages like Tamil and Kannada, the so-called Dravidian languages. Linguists tend to believe that Sanskrit borrowed the retroflex consonants from those languages. To produce these consonants, we stop the air at the base of the top row of teeth. To stop the air, we use the tip of the tongue. These English sounds are not the same as their Sanskrit counterparts, although the difference is quite subtle. The consonants above use a point of pronunciation that sits at the base of the teeth, and it is not found in English. The closest English match places the point of pronunciation more forward, near the edge of the teeth. To produce these consonants, we stop the air with the lips. We don't use the tongue at all! Let's wait one more lesson before adding consonants to our alphabet. A consonant that is produced by stopping and quickly releasing air in the mouth. A consonant that is produced by stopping air in the mouth and redirecting air through the nose. The location of the tongue when we pronounce a letter. The hard and bony part in front of the soft palate. a name given to sounds that require you to bend your tongue ("-flex") backward ("retro-"). I hope you know what these are! To learn what these consonants are, proceed to the next lesson.